2013, HD video, color/sound, 36 mins. Stylistically, The Realist uses a technique I developed for my 2001 film Angel Beach, alternating between the left- and right-eye images of stereo 3D photographs. (The "Realist" was also the name of a popular stereo camera sold in the 1950s and 60s.) 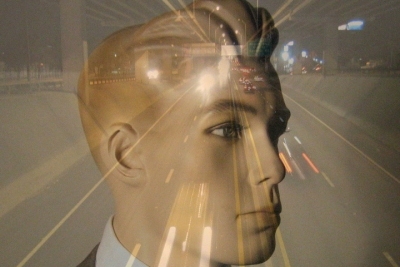 In The Realist, this alternating-image technique creates a flickering, trembling, dazzling trajectory through the worlds of department store displays and storefront windows. The constant flickering and rhythmic editing between scenes creates a visual tension that teeters on the edge of abstraction but never entirely loses its grounding in reality. The mannequins seem to be trying to wriggle themselves free from their predetermined poses, and mysterious, abstract shapes sometimes emerge out of the confusion of odd movements and juxtapositions. A looping musical soundtrack (composer Daniel Goode's Tunnel-Funnel) punctuates the lyrical editing and drives the dramatic fructuations. "Wonderful... The Realist employs a 'realism' well beyond anything Bazin might have advised, letting the construction of the process come forward in a manner that produces one coherence (moving bodies) at the expense of another (cyclotronic, Cubist space). The Reaist is a film about a universe so perverse that it can no longer keep its fetishes straight." -- Michael Sicinski, "The Hollow Ones: Scott Stark's 'The Realist'"
"A mesmerizing work." Cheryl Eddy, Are You Experimental?, San Francisco Bay Guardian, April 2, 2013. "The Realist is an illustrated AMERICAN BIBLE of its heart of darkness: where desire lays waste to Eden's Garden." Lily White, filmmaker.